The Madix™ Add-On Wall Gondola Unit is the best choice for your convenience store or retail sales floor. The ease and versatility of the unit make it ideal for simple floor moves, adding and removing additional units. Madix™ brand Gondola units are synonymous with quality and flexibility. 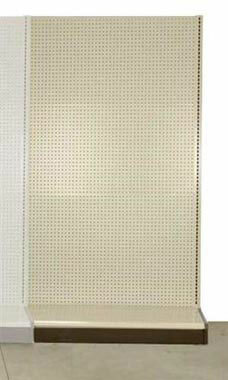 This unit features a strong metal structure and durable hardboard pegboard backing. Wall units do not have a finished back. These units are meant to be installed with the back facing the wall. The unit does not require bolts, nuts, screws or tools. These can be assembled by hand in less than one hour. Add optional shelving and fencing to complete the look of your unit. Learn how to Organize Your Store with Gondolas in the Customer Connection section of our website!